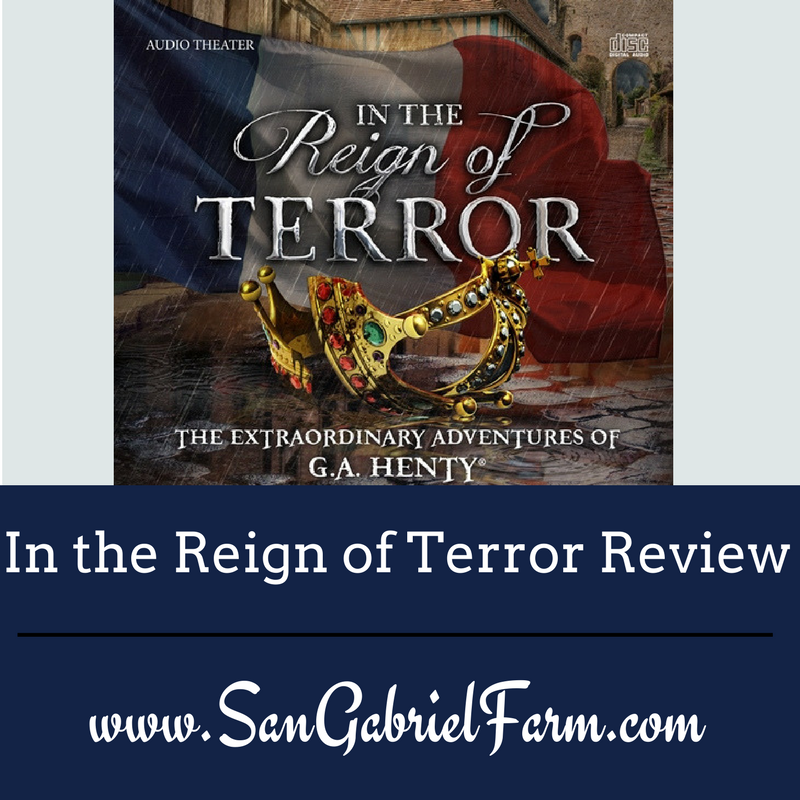 If your family is going to be studying the French Revolution, you might consider adding an audio program to your studies, like In the Reign of Terror by Heirloom Audio Productions. We had the opportunity to review this CD while on a long road trip and absolutely loved it. We received this CD two days before a road trip from Texas to the state of Washington. I was so excited to be able to have uninterrupted time to listen to this audio CD on our trip! The story begins in current times with a young man visiting the grave of one of his descendants and an older gentleman is there and they begin this discussion of the importance of the American Revolution. The discussion turns to the French Revolution and how the young man believes that Robespierre was a good man with high ideals. The older gentleman, rather than explaining that the French Revolution and American Revolution were actually focused on different things, he begins the story of In the Reign of Terror. It’s framed in the context of a young man who’s visiting a wealthy French family and how the French Revolution begins to affect this family, and in turn, the nation. Rather than go into the story itself (as you really need to listen to it), I would like to point out that the story was very interesting. The short version is that we loved the story line, the action, the actors/drama. It was engaging and gripping. We were on the edge of our seats for much of it. Not only does it go into the history of the French Revolution, but adds moral characteristics and how it’s important to do the right thing all the time. This audio story is based on the book by G.A. Henty, an English author in the mid-to-late 19th century. He wrote a series of historical novels for young boys ranging anywhere from ancient Egypt through various wars he actually served in. These books have withstood the test of time and are still available to read … or better yet – to listen to, such as In the Reign of Terror when you’re studying the French Revolution. Heirloom Audio Productions has many of these titles on audio. They are very high quality with great acting from well-known actors. Definitely worth the small investment. Plus, it’ll last a long time and you can listen to them again and again. When you order through their website you’ll receive a FREE 3-month trial membership ($24.75 value). Every 3 months after that you’ll be charged $24.75 (once a quarter) to maintain your membership. If you were to purchase the annual releases separately it would be about $114 (about 3 new releases each year), but with the Live the Adventure Club membership, you’ll receive all three for FREE (along with all the other bonus content) for about $99/year. That’s a great deal considering all of the content I saw on the club website. It’s a LOT of goodies. Since we are reviewing In the Reign of Terror, I went to the Educational Treasures section and downloaded its study guide. The guide contains background information on key characters, questions and answers, opportunities to dive further into the history of the French Revolution, as well as Bible study questions. Connect with Heirloom Audio on social media! I'm a Realtor by trade and would love to help you find that perfect homestead. Contact me today to make your dream a reality. I am an affiliate with numerous companies. If you purchase anything from the links on this site, please know that I do receive a commission from those purchases. But, it doesn't cost you anything extra! It helps me support my family and this blog, as well as help you. It's a win-win!